Free 10 parts warranty on Amana Furnaces. our comfort specialist for details. 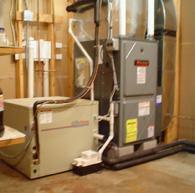 efficiency of your HVAC system. We service & sell High Efficient Amana & Lennox furnaces, central air conditioners & heat pumps. We also service and sell oil furnaces, mobile home furnaces, gas & oil boilers, air to air exchangers and in floor heat and ground water heat pumps. We also install central vacuuming systems, a great feature for your new home. Under our 'HVAC' page you will see a drop down for 'Job Photo's'. Click on it to see more pictures of some jobs we have done for residential and commercial customers. Click here to go to Lennox.com Furnaces Page. or Click on the Amana furnace image above to go to Amana's web site! You will find us on both sites. and we are listed on top of that page. "Find a dealer"> (by Postal or zip code). we should be listed #1 on that page as well. Like heat pumps, furnaces keep your home warm in the winter and serve as an important part of your homes central air conditioning system in the summer. In a furnace, gas or oil is combusted in a burner and then heat produced from that reaction passes through a heat exchanger where it is transferred to the air distribution system - duct work. 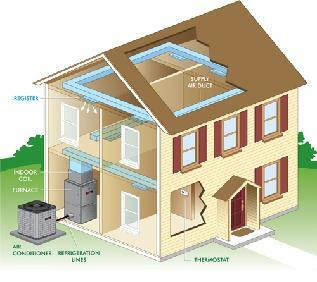 The ductwork, throughout a home carries and distributes the heated or cooled air. The chimney, flue or vent pipes release the byproducts, such as water vapor and carbon dioxide. That is why we can not express enough the importance of having your HVAC system checked and clean every year or at the very least every other year. For a system 15 years or older it should be done every year. Did you know that many manufactures require you to have your HVAC system cleaned and checked by a certified HVAC technician (generally one that is trained to service their equipment) annually or any and all warranties are null and void. Check with your manufactures for their rules and restrictions. Another myth is that you have to have your system cleaned before you can use it, that is false. Most heating contractors are slower in the late winter/early spring and this is an ideal time to get your system checked. Call us or whoever installed your system and have it thoroughly checked today for the safety of you and your family! Below are two commercials that myself & our comfort specialist (and my Uncle) Orville recorded. We were terrible. Orv didn't know where to look & my neck was so bad as I had not had my surgery to repair my broken neck yet so, needless to say we are horrible....enjoy a good laugh! We sure did! Commercials that we never aired as I had not had my neck surgery yet so were just terrible. With my Uncle Orv...too funny! Our other commercial we recorded with Dave Lennox but never airs, you can see why....hilarious stuff!